We are very pleased to report that the acquisition of Bella Island by Mahone Islands Conservation Association and the Province of Nova Scotia has been successfully completed. Bella is now a public island that will be conserved and be available for traditional public use. The island will be protected by a joint MICA/PNS Stewardship Agreement. We offer a sincere thank you to those of you who have responded to our appeal by making a financial contribution to this important project. We have met our commitment and goal of providing $250,000 towards this acquisition. We would also like to thank all those who contributed to our recent Gala Dinner and Auction which set a new fundraising record for this event and was an important contributor to the project. To our Corporate Sponsors, live auction and silent auction donors and all those who attended, thank you. We recognize the Province of Nova Scotia and the Nova Scotia Department of Natural Resources for their significant support in this acquisition project, without which it would not have happened. Bella Island has long been on our priority list as a strategic acquisition and we are so pleased and grateful that collectively, we have made it happen. As this project and the Masons Island lots project will largely deplete our financial resources, any donations are certainly appreciated and will be applied in working towards our Mission. If you have any questions please contact any of the MICA Directors. Thank you for enabling MICA to continue pursuing a legacy for future generations. We are very excited to announce that we have signed a Purchase and Sale Agreement for Bella Island with our major funding partner, the Nova Scotia Department of Natural Resources. The property closing is December 18, 2013 and we ask for your help. Bella Island is one of the few remaining privately owned islands in Mahone Bay in its natural state. It is approximately 24 acres, has a very popular beach and cove on the southern end facing west. There also is a smaller beach, facing west, on the northern end of the island. Bella is a gem that must be preserved. We are able to make this commitment because of the significant contribution by our major funding partner, the Province of Nova Scotia. This acquisition is subject to the normal conditions including approval of Cabinet and MICA being able to raise sufficient funds. MICA must provide $250,000 to close this acquisition. We currently have $90,000 cash available for the project. Therefore we must raise $160,000 by December 18. Our Gala Dinner and Auction, this year on November 1 is expected to net $60,000. 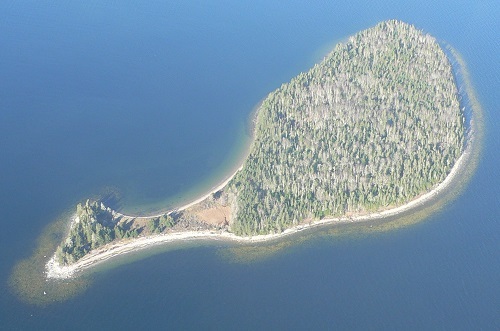 That leaves $100,000 required from a special fundraising campaign to enable us to bring Bella Island back into public ownership to be conserved and to be available for traditional public use. We appeal to you, our members and friends, to heartily respond to this request so that Bella Island can be enjoyed by current and future generations. Donations will be kept confidential. Your recognition will be in the form of a heartfelt written thank you, a postcard photo and a tax receipt. By donating, you will be an important part of the legacy we are creating. In the unlikely event that the deal falls through, funds donated to MICA will be retained for a future acquisition project. Once we are able to make this acquisition, Bella will be protected in perpetuity by a Stewardship Agreement between MICA and the province, as are the other MICA islands. As an update on our acquisition of part of Masons Island with our partner the Municipality of the District of Lunenburg, we were able to make the financial commitment on this project without a special fundraising campaign because of the cash reserves we had from previous Gala Dinner and Auctions and donations. In conclusion, MICA members and friends, thank you for your significant support to date and for your consideration of this request. Since our beginnings in 2002, we have privately raised nearly $1,000,000 and with our major funding partners, the Municipality of the District of Lunenburg and the Province of Nova Scotia, have established a very significant legacy in Mahone Bay. This legacy consists of Andrews Island, Backmans Island, Covey Island, the northern part of Masons Island, Sacrifice Island, and Shag Island (Indian on the chart). In addition, Long, Centre, Dry and Snipe were very generously donated by the Long Island Preservation Society. As well, Big Fish, Clay Island and Round Island Nubble on the Chester side of the bay have been brought back into public ownership and a conservation easement has been placed on Little Gooseberry. All these islands are now conserved and available for traditional public use. Let's make sure we can include Bella Island in this legacy. Tax receipts will be issued for all donations over $10. An alternative is donating shares. It is a very simple process. We provide a tax receipt for the total market value of the shares at closing on the day received and capital gains are not an issue. Please contact Sherry Swinamer, our Treasurer (swina179@eastlink.ca) if this is an option you would like to explore. If you have any questions please contact any of the MICA Directors linked below. Thank you for enabling MICA to continue pursuing a legacy for future generations.